This entry was posted in Ray Mears, Site Announcements on November 14, 2012 by Woodlore Team. Took my father to the evening with Ray in Leeds. Absolutely riveting we both said that if was on the next night we would go again. Ray spoke from 1930 to 2100 stopped for a short break then carried on till 2300 and stayed to sign autographs in his new book. He is an absolute legend I will never tire of listening to his experiences and views on the world. It would be great if he would consider doing a tour round schools as his views on conservation were certainly the way forward and would be an inspiration to the next generation. Hoping there will be a tour in 2014 I’m sure he has so much more to share. What a great evening in Derby . Informative and compelling lecture by the one and only master of bushccraft . Real pleasure to meet him afterwards , hope there will be many more opportunities over the coming years . I would just like to say what a fantastic evening my girlfriend and I had last night at Birmingham Symphony Hall with Ray Mears. The whole evening was full of interesting facts, great slides and humour all delivered impeccably by Ray. I purchased Ray’s book whilst there and he was happy to sign it and also to sit for photos. We would both happily go to another ‘Evening with Ray Mears’. Top bloke! Expect to enjoy a fantastic evening! If you’re lucky to have tickets, for those travelling by public transport, beware he can run over time a little, we had to leave half way through that 2nd half of the show in Leeds to get the last bus back to York, and we had fabulous seats 4 rows from the front too! GUTTED!! =( so, sorry Ray if you saw us quietly leaving while you were in full swing, we were sooo sad not to see the whole show, (i actually sulked all the way home! )especially as we’d been looking forward to it for many months. You are a national treasure and your show was fascinating! what was the initial song played at the start? can anyone help please? What a wonderful evening I had seeing Ray Mears in Leeds last night, I was totally enthralled by his talk. I came away having a deeper respect for nature, and our place in it. Thank You! Please can someone let me know roughly how long the talk is…ie what time we should expect to leave by? 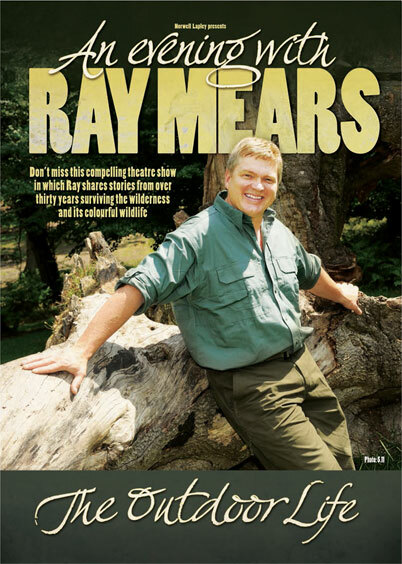 what an evening in Malvern 26th oct, ray mears is a fantastic speaker, and you get drawn in to the world of nature and conservation, and his many stories on his travels around the world that make you laugh. and the dangers to look out for, when your in the wild. thank you ray for a totally fantastic evening. interesting and extremely inspirational. enjoy the rest of the tour. best wishes. Does anyone remember the name of the author who wrote the survival/bushcraft childrens story in Ray Mears talk last night? Wondered if you can purchase a copy as would be a fantastic school assembly idea. I attended the Lighthouse, Poole lecture last night and found myself totally drawn in. Ray Is a fantastic speaker with lots of interesting stories. I love his passion in conservation and wish the whole world could be as passionate as he is. I loved the story of the native hunting the Caribou and making a sleeping bag from the hyde. Can anyone please refresh my mind who that person was???? I would love to know more about them. Thanks Ray for a true inspiring evening. 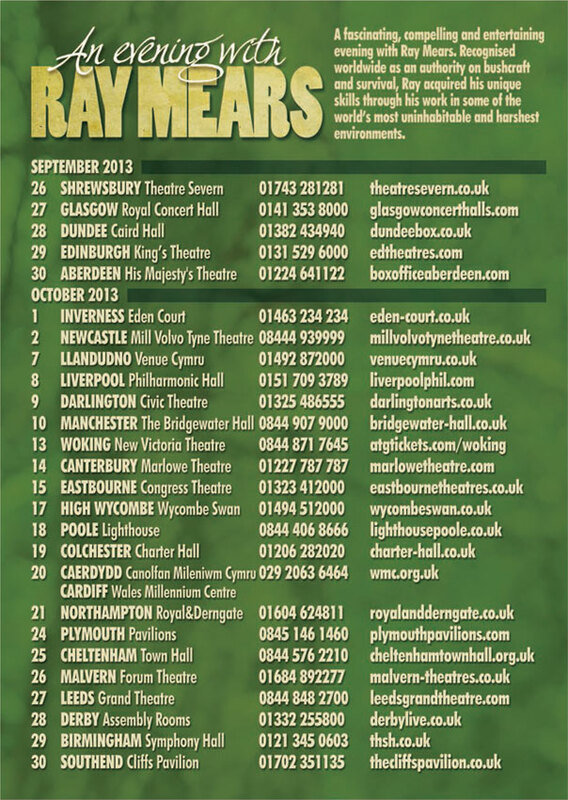 I had a brilliant night at Ray’s Lecture at the Congress Theatre yesterday evening. It was wonderful to see him in person and hear his incredible stories over the last 30 years. Ray is a fantastic speaker, a very calm, friendly and inspiring person and an absolute pleasure to listen to. I wouldn’t hesitate in going again or recommending anyone else to go, his passion for bushcraft, conservation and nature is infectious. Thank you Ray, you were fantastic. Had a wonderful evening at eastbourne last night. Ray is a captivating speaker and the atmosphere was as if we was sitting around a campfire listening to an old friend telling interesting stories. Without a doubt the underlying message of the evening was of conservation and preservation of the natural world and it’s life. A lot of food for thought and just as we eat food to give us energy to act and move, we should use Rays message to give us the energy to act and take action on conservation of species both home and abroad before they are lost forever. As a woodlore student it was also a honour to meet And shake hands with Ray after the show and to take the opportunity to thank him for the work that he does. Ray very kindly stopped to sign books after the show. Would really love to see an Irish/Northern Irish date! Thoroughly enjoyed Ray’s lecture to a packed house in Darlington last night. His stories were heart-warming and the underlying message on conservation very thought-provoking. Listening to Ray was like being transported to the wilderness on a great adventure. He showed the rare wisdom and calmness of someone in equilibrium with the world – the perfect campfire companion. LLandudno last night, excellent well presented talk, beautiful pictures.